A few days after our Seattle visit we decided to go back. 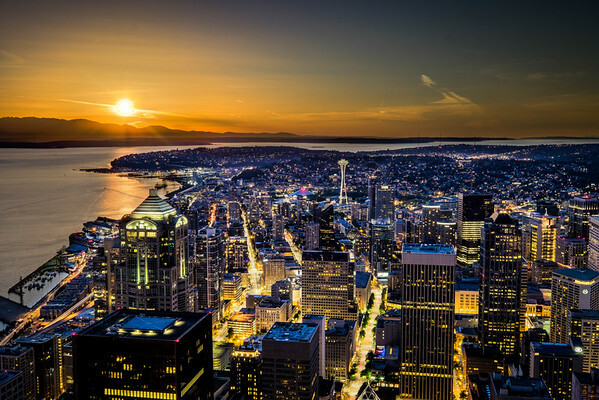 We thought it would be fun to watch the sun set over the city from the Columbia Tower. The Columbia Tower is the tallest building in the city and is 943 feet high. It was build back in 2007 and cost a whopping $200 million. The tower has 76 floors and the story goes that the Architect (Chester Lindsey) wanted 76 to celebrate his fathers 76th birthday. However the height of the building was going to be too high and violated Federal Aviation Administration (FAA) rules as the building was under the approach flight path to SeaTac airport. So Chester solved the problem by dropping the height of each floor by 2 inches, just getting under the approved height! Anyway the 73rd floor has a “Sky View Observatory” that costs $12 to visit and it gives you a panoramic view of the city. We got to the tower about 8:30 (sun was supposed to set at 9pm) and I checked out the views. My idea was to set the camera up on a tripod and start taking pictures as the sun was going down, and keep going until well after it had set and the city lights had come on. For this shoot I had my 10-24mm ultra wide set to f/11 – that way I’d get everything in focus. After walking round the building a couple of times I picked my spot shooting directly into the sun over the Olympics with the City (and Space Needle) in my foreground. I put the camera on the Tripod, connected the shutter release cable and started taking pictures. Now I should point out that I had my wife, two kids and father in-law (with his wife) with me. – I really should have thought this though, as by 9pm as the sun was going down they were all getting board! So I had to keep apologizing as I wasn’t going anywhere for another half hour – at least! I had a couple of close issues, my battery ran out at about ten past nine, so I had to change that without moving the camera, and a load of people kept coming by and got way too close to the setup. Anyway by 9:30, my son came and told me that if I wanted to live I needed to pack up NOW – Lisa was not happy. So I grabbed everything and we left with me hoping I had enough. When we got home I started processing. What I wanted was the sun going down over the mountains with a nice amount of light over the water, but with the city lights on. Obviously this is an impossible image as you can’t see both at the same time. So it was clearly time for Photoshop magic. In the end I picked two images. One at around 8:50 with the sun really low in the sky, and the other was the last one I took at 9:30. I added some adjustments in Lightroom to both pictures to get a great sky and backdrop in one and a great city in the other, and then manually blended them together with layers and an overlay mask. The end result is the image below. OK, so this isn’t real, it’s art, but so is EVERY OTHER PICTURE like this you have ever seen :-) This is just my version.